Left to right: Black Half Sleeve Casual Dress, Black Round Neck Asymmetrical Flare Dress, Black Long Sleeve Casual T-Shirt Dress, Black Twin Pocket Half Sleeve Dress. It's a bit hard to see the differences but the first dress here, the Black Half Sleeve Casual Dress, is a shift-type dress that slims the figure thanks to the heavy-ish weighted poly fabric that is super comfortable. This dress is more casual than the others because of the raglan-style sleeves, which you cannot tell unless seeing it in person since it's black on black. The second Black Round Neck Asymmetrical Flare Dressis a shiny-ish stretchy poly fabric that drapes really nicely and has more fitted sleeves. The Black Long Sleeve Casual T-Shirt Dressis a super basic long-sleeved lightweight black jersey dress that I've been looking for even before the pregnancy that is super comfy and versatile. Lastly, the Black Twin Pocket Half Sleeve Dress isn't a dress that I'll be able to wear later on in pregnancy but it's a flattering cut and thicker material that looks cute and is worth keeping at just $10. Left to right: Grey White Colorblock Casual Dress, Blue Sweetheart High Low Dress, Wine Red Long Sleeve Casual Dress. I really like the simplicity and thick-ish material of the Grey White Colorblock Casual Dress, which drapes nicely and isn't clingy to the body. The Blue Sweetheart High Low Dress is perfect for my BFF's bachelorette party next month, which has a night-out theme of blue. I wanted to be both comfy and not draw attention to my bump, which I think this does very nicely. 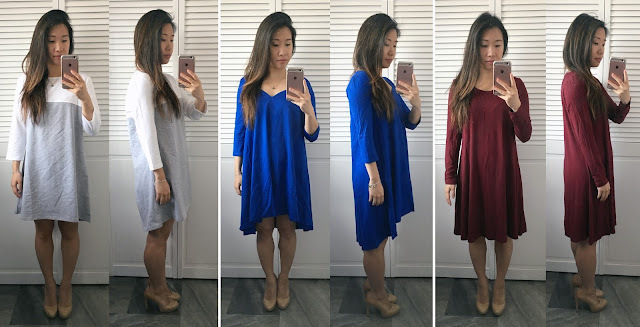 Lastly, I like this comfy and casual Wine Red Long Sleeve Casual Dress, mostly because of the cute X detailing at the top of the back, which you can't see in my photos but can in the link. 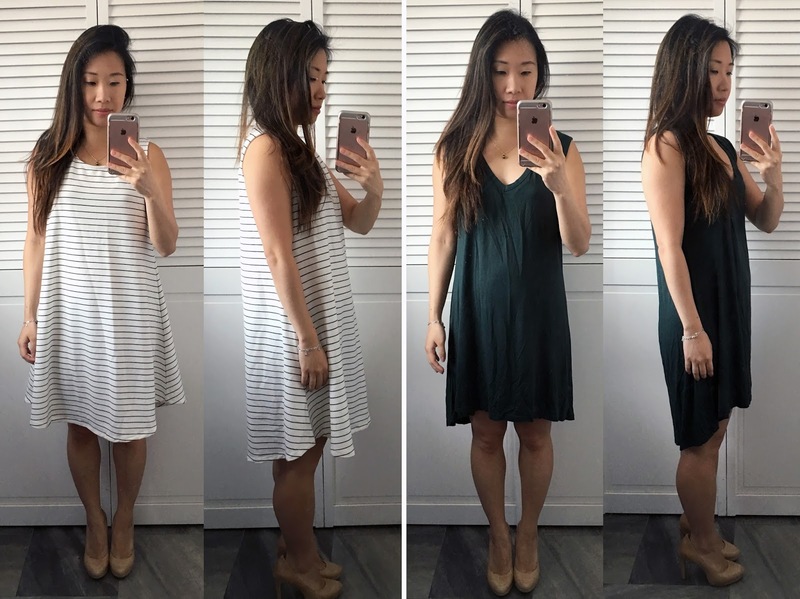 This White Sleeveless Tent Dress on the left is of a heavy cotton blend terry-type material that seems quite durable and does not have too much stretch but is a nice basic piece that can be layered and also worn alone on hot summer days, which I'm not looking forward to. This Green Minis Sleeveless Vest is the total opposite in a super lightweight fabric that feels great and drapes very nicely on the body in a pretty hunter green color.